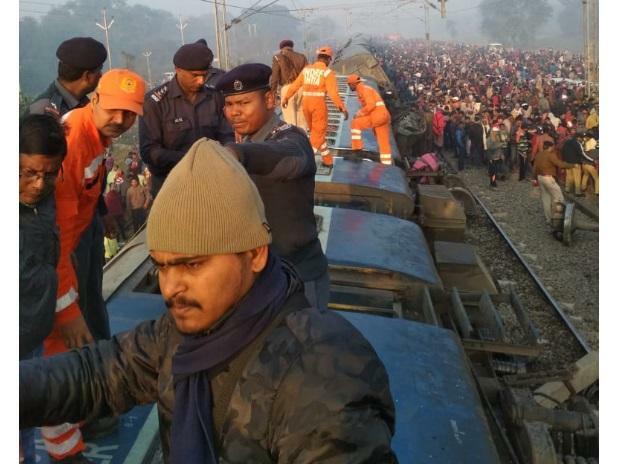 Six people died and 24 people were injured on Sunday after eleven coaches of the Delhi-bound Seemanchal Express derailed in Vaishali district of Bihar, railway officials said. According to information received from Sonpur Division, the train passed Mehnar Road at 3:52 am and derailed near Sahadai Buzurg at around 3:58 am. Railways would give ex-gratia of Rs 5 lakh each to the kin of every deceased, Rs 1 lakh would be given to the severely injured and Rs 50,000 to those who suffered minor injuries. All medical expenses will also be borne by Railways. Bihar government has announced to give Rs four lakh each to the kin of every deceased & Rs 50,000 to the injured. One general coach, one AC coach B3, three sleeper coaches -S8, S9, S10 and four more coaches have derailed, said East Central Railway spokesperson Rajesh Kumar. Prima facie cause of the derailment is rail fracture of CMS X-Ing at Barauni end of station yard, said Rajesh Kumar. Unaffected 12 coaches are being moved to Hajipur where more coaches to be attached and the train will move for Anand Vihar Terminal railway station. The 12487 Jogbani-Anand Vihar Terminal Seemanchal Express was running at full speed when the accident occurred, the officials said. The injured were rushed to a hospital in Sonpur, where the doctors referred the seriously wounded to Muzaffarpur and Patna. A team of doctors has rushed to the accident site from Sonpur and Barauni. An accident relief train has also moved for carrying out relief and rescue operations. "As of now, it is not clear whether the derailment of the 12487 Jogbani-Anand Vihar Seemanchal Express was caused by a human error or a technical fault. This would be investigated once the rescue operations were complete and the affected Barauni-Bachhwara-Hajipur single line was cleared," Rajesh Kumar, Chief Public Relations Officer, East Central Zone, said. Railway Minister Piyush Goyal stated that rescue and relief operations have begun. Prime Minister Narendra Modi said, "Deeply anguished by loss of lives due to the derailment of coaches of SeemanchalExpress. My thoughts are with the bereaved families. May the injured recover quickly.Railways, NDRF and local authorities are providing all possible assistance in wake of the accident." "Rescue and relief operations are on for derailment of 9 coaches of Jogbani-Anand Vihar Terminal Seemanchal express at Sahadai Buzurg, Bihar. Helplines: Sonpur 06158221645, Hajipur 06224272230 and Barauni 06279232222," read a tweet from Piyush Goyal Office. Bihar Chief Minister Nitish Kumar, who expressed deep condolences over the deaths, said, "The district magistrate and the superintendent of police have rushed to the spot and are overseeing the relief work in coordination with the Railways."